Nothing gets stuck in your teeth like popcorn. Every time I eat it I am optimistic about the forthcoming pearly white issues thinking, “No, it won’t be like last time. I’ll be extra cautious”, but yet I’m forever picking bits out of my teeth in the popcorn aftermath. This is never a good look. Why do we do it to ourselves? I know I’m not the only one. 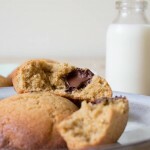 I can think of one very good reason: because it’s damn delicious, there’s nothing else like it and when you make your own you can truly make it your own. Get a large pan with a lid on a medium/high heat. Drizzle on a little oil and swirl it around so it covers the base of the pan. Put the popcorn into the pan and put the lid on (it helps if it’s a clear lid). 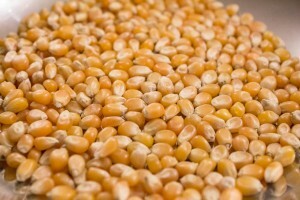 Keep the pan swirling around so that the popcorn doesn’t catch and wait for the corn to start popping. Keep the pan moving until you can’t hear (or see) any more pops. Remove the pan from the heat and take the lid off to let any steam escape. 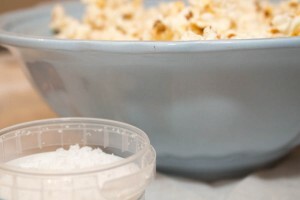 Empty the popcorn into a large bowl and sprinkle over the salt and maple syrup, mix everything together well. When you weigh out the 75g it doesn’t look like much, you might accuse me of being tight, but it is enough to fill a large bowl, honestly. Warm popcorn with a bit of salt and a bit of sweet; no more arguing over which one to buy. When I make my own popcorn I just can’t get over the price of it at the cinema! It’s so quick and cheap to make and with your own you know what’s in your bowl. This makes a great film accompaniment but also a nice change to crisps or biscuits that you (and by ‘you’ definitely not meaning ‘I’ *ahem*) can sometimes snack on. I haven’t made my own popcorn for ages! 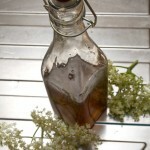 I am afraid if I would start I wouldn’t be able to stop :)) anyway I like the idea of making it with maple syrup.. I love that these are sweet/salty! Sounds addictive. Never made popcorn in my entire life. I love it and I shall try out. Lovely with the coating of maple syrup. I hope I can try with honey?? Yummy. Think Friday teatime popcorn may be in order this week. 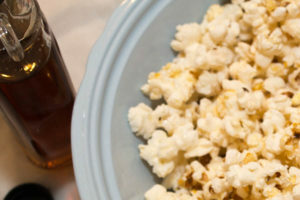 i’m on a popcorn kick right now, but i haven’t tried maple syrup–wonderful idea! I’m such an addict for popcorn. Sweet popcorn is a whole other thing. I can’t stop! I know how addictive the popcorn can be! Sweet and salty homemade popcorn – why yes – i will take another serving! Popcorn is probably my favourite snack in the world! I will definitely be trying this recipe, thanks! Yeah, that cinema popcorn is outrageously priced, isn’t it? And that topping they use, although it tastes pretty good for the first handful or two, is kinda weird. Nothing weird about maple syrup and salt! Great topping. Fun post — thanks. I am a HUGE fan of popcorn and I love, love the sound of yours sweetened with maple syrup! Great idea! Sounds delicious maple and salt…like savory with sweet…yum! I’ve patiently waiting for the day that both kids are out of braces and we can again enjoy popcorn. This looks delicious! 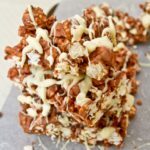 We make loads of popcorn, sweet for my son, salty for my daughter and a mix for my husband and I – just love it, but maple syrup, haven’t tried that yet, what a great idea! It’s so worth it though because popcorn is delicious! I can’t wait to try this topping for it as it sounds amazing!